The versatile A3 Multifunctional Printer AR-6020V is a smart all-in-one document solution for the upwardly mobile small business. Naturally, it excels in its core role of copying, printing, and scanning documents with text and images. But beyond that, it offers flexibility in the form of upgradeable hardware and software. The 6020V is designed to put sophisticated document functionality in the hands of every office user. End result: greater productivity for you and your team. Adding the optional AR-NB7 N Network Expansion Kit upgrades the AR-6023V/6020V to a full-colour network scanner, enhancing its scan functionality. Sharpdesk Mobile is a mobile print/scan application. With Sharpdesk Mobile, users can import documents scanned on the AR-6020V to their mobile devices for previewing and saving. 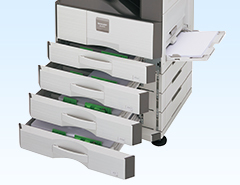 And files on a mobile device can be printed out on the MFP, sent as e-mail attachments, or used in other applications. The AR-6020V works as a full-colour A3 scanner. In addition to scanning via a TWAIN driver, the MFP has a Button Manager function. As well as letting you adjust settings such as scan resolution, this function allows you to assign applications such as e-mail, Microsoft® Word, OCR, and Sharpdesk to six Scan Menu buttons on the MFP’s control panel. Scanning, data transfer, and application start-up can all be done automatically. Operation is quick and easy—simply tap the Scan Mode button, select a pre-registered Scan Menu button, and press Start. For large-volume jobs and a wider selection of available paper sizes, these MFPs can accommodate two types of extra trays that increase total paper capacity to 1,850 sheets. These MFPs can accommodate heavy paper up to 200 g/m2*, expanding the range of possible printing applications.